XV Crosstrek Hybrid and WRX Concept: What do they reveal? The new 2014 Subaru XV Crosstrek Hybrid and WRX Concept have just been unveiled in New York, but what do they reveal about the future of the brand? The new 2014 Subaru XV Crosstrek Hybrid and WRX Concept vehicles have just made their global premiere at the Javitz Center at the New York International Auto Show. There have been dozens of auto journalists who have written about them including myself and our highly esteemed editor here at Torque News. But what do these two very important vehicles tell us about the future of the brand? The two cars are the latest examples of what Subaru is up to and we can learn much about the future direction of the company. Why did Subaru chose to reveal the two cars in New York and not Geneva? The U.S. is Subaru’s largest market and they know where their bread is buttered. The Japanese automaker knows the North American market is a key for their future growth and chose New York for that reason. Subaru has experienced strong sales of the new Impreza, 2013 BRZ and XV Crosstrek, and will need to invest $230 million into their U.S. Indiana plant and increase production by 30 percent. They chose the U.S. plant over a Mexico site to keep production closer to where they are experiencing the most sales. Subaru is committed to the future of protecting the environment and with the help of parent company Fuji Heavy Industries, they will further their research and development of the technology. Ikeda went on to say, “We know that further environmental requirement will come and so, we have placed vehicle electrification as a key theme for the future of Subaru. The hybrid we will show you today is our first step in that direction.” Subaru is committed to the future of alternative propulsion and we can expect to see much more in the future. 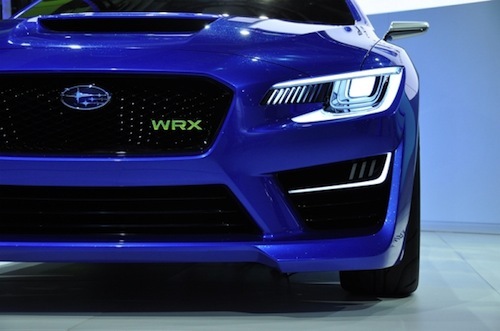 The new WRX Concept that was just unveiled in New York tells us that Subaru is also committed to rolling out more performance models than ever before. We see a new turbocharged intercooled engine with more power that could also be used to power the BRZ. We can look for improved handling from a tuned chassis and lighter vehicle weights through the development and use of carbon fiber. We can look for even more AWD grip and road hugging performance from the patented Subaru Symmetrical all-wheel-drive system that is being improved. The future of performance is alive and well at Subaru. Tomohiko Ikeda said recently, “You know that Subaru is well known for its performance models and our passionate owners always want to know what we are thinking in the area. Today we will give you a message that Subaru will continue to be committed to performance products.” The future can also be seen in the new VIZIV Concept that was unveiled in Geneva and shows a new design language and technology that is coming. Whether you are into green and clean or high-performance, the new 2014 Subaru XV Crosstrek Hybrid and WRX Concept vehicles show that Subaru products will make their customers lives much more enjoyable.